Pilotwings was first released on the SNES. A 'show off' release, to debut the newly released consoles performance capabilities. Then a sequel named Pilotwings 64, was released on the Nintendo 64 in 1996. And sixteen years later Nintendo have reached into their attic and decided to rid the dust and firmly polish the series into the 21st century. 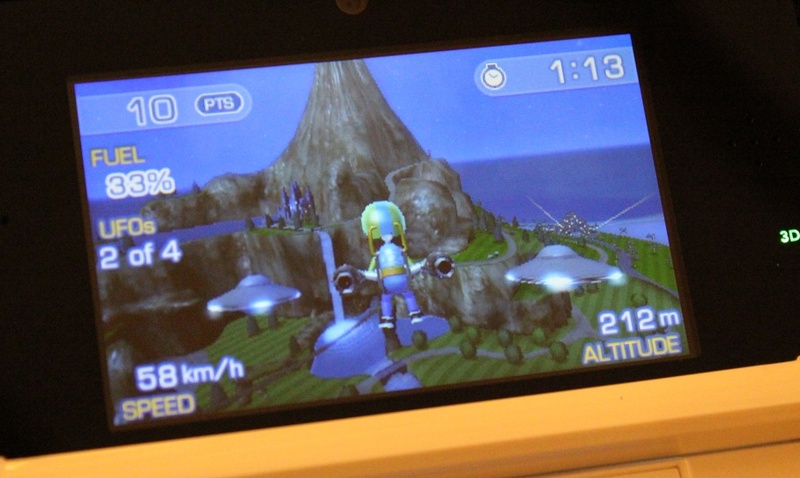 Introducing Pilotwings Resort for the Nintendo 3DS. It's a release that will feel familiar to previous players of the series and avid Wii fans alike. The reason for this familiarity is all down to the setting, WuHu island. The same island used in Wii Sports Resort. It's not a bad choice though, WuHu has already been established as a fly over landmark in one of the more enjoyable modes within Wii Sports Resort. In a lot of respects Nintendo are using the Pilotwings series as a 'show off' release once again. This entry packs 3D viewing and joypad controls, both not reachable on previous Nintendo handhelds. Nintendo have clearly invested much effort into the new control scheme and 3D viewing. Each aircraft uses a different set of controls but all share the joypad as a method of directional control. It's precise and once again shows why the joypad is so important for precision. 3D is undoubtably this releases killer feature and rightly so, the effect is spine tingling. Your Mii and aircraft are noticeably in the foreground. Trees, buildings and such are visibly in the distance. The 3D is a marvellously helpful game mechanic, for judging distance when collecting balloons or zooming through a ring mid air. A layer of precision is introduced from the implementation. I didn't find the 3D annoying either, no eye ache or headaches to speak of. Free Flight mode demands you explore the island from top to bottom, literally. Pick your aircraft and take flight. Having to carefully manoeuvre between tight buildings to burst a balloon or glide just above the islands volcano to shoot through a ring, ticking another one of the 75 locations to discover off your list. It's primarily a collection driven mode that's gets richer with features, as you progress through the primarily game mode, Mission Mode. Mission Mode hosts quick mini game like objectives, set within time constrained perimeters. Over 40 missions are included within five tiers. Novice, Bronze, Silver, Gold, Platinum and Diamond. The objectives needed to be carried out include, going through rings, hitting speed targets, catching falling parachute point pills, helping UFO's back to the master ship, putting out fires, bursting balloons and landing securely on launch pads. I found there to be a good amount of variety. I really enjoyed the mission where you're required to disguise fires across the island with your plane, I especially liked the little touch of refilling the planes water supply by dipping it into the sea. But was saddened to see this only ever executed once, the same goes for the UFO mission. As you progress from mission to mission, the game gets increasingly challenging. Achieving the highest rating of three stars seems like a near impossibility on some of the later missions. Stars are a necessity because they're needed to unlock future tiers of missions. I'm not complaining, the challenge contained my interest and was in turn very rewarding when I did score that perfect three full stars. The range of flying contraptions gets more intriguing as you progress too. Three main types of aircraft are included, with planes, rocket belts (jet packs) and hand gliders. Each has it's own distinct style of flying. The plane is the most agile of the three, due to it having an engine and can additionally perform stunts. The rocket belts are constrained by fuel, but offer very definite accuracy. Hand gliders, feel very free but will loose momentum, luckily wind tunnels are scattered across the map to build it back up. I however really enjoyed using the squirrel suits, packing very rapid performance but will eventually loose momentum like the hand gliders. For that personal touch, you can pick one of your Mii's stored on the 3DS to pilot the aircraft. My biggest complaint is the non existent multiplayer. It would have been most enjoyable cutting the skies, dog fighting and performing missions with others. It just seems like a severely missed opportunity. WuHu island looks and feels just like it did on the Wii, with it's tropical beach vibe. 3D makes it's impression seem more alive and real, a striking feat for a handheld title. Graphically it's very clean and sharp. Block and cartoony colours are used throughout and I rather admire this style, All aircrafts share these styles too. Water effects are worth noting, they shimmer in the sun and look very idyllic. After beating the entire game, I can confirm that I didn't experience any frame rate issues or general performance issues, the 3DS kept up with the at times hurried action. Overall Pilotwings Resort is an enjoyable release. Displaying a worthy degree of variety spread across 40+ missions (with the occasional missed opportunity). Topped off with first-rate controls and sublime 3D gameplay. Available to purchase in physical cartridge form or instantly via the Nintendo eShop.